Dubai police will use facial recognition and Google Glass to look for wanted criminals. 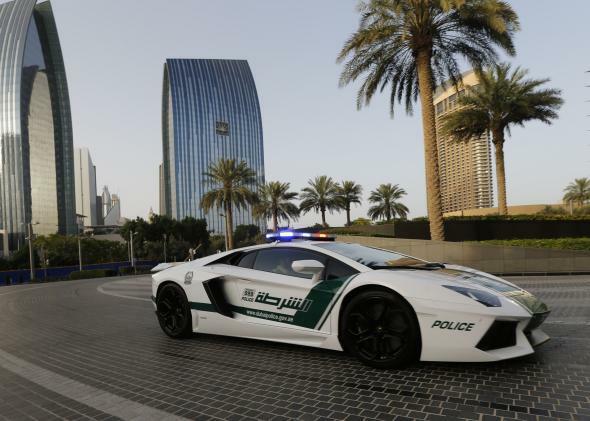 Dubai police in a specially modified Lamborghini Aventador. The FBI is ramping up its facial recognition database and doctors are trying out Google Glass in emergency rooms. Now the Dubai police want to take it all to the streets. Reuters reports that the city is going to start equipping officers with Glass so they can use facial recognition to look for wanted criminals. A Dubai police spokesperson told the 7 Days newspaper that custom-made software will allow the officers’ Glass to sync with a database of faces. That way if police officers encounter wanted crooks, their eyewear can alert them. The Dubai police department will do a pilot phase where officers wear Glass to track traffic violations and look for offending vehicles. If that goes well, Glass will be distributed to detectives for the facial recognition program. Each Glass costs $1,500, a price point that Reuters points out is in line with Dubai police’s $400,000 Lamborghinis. (They’re used to maintain the city’s luxury image in areas that attract a lot of tourists.) Lavish law enforcement!